21 June 2017: It took seven years and 61 attempts, but, in May, the US House of Representatives managed to repeal the ‘Affordable Care Act’, commonly known as Obamacare, and replace it with the ‘American Health Care Act’ (call it Trumpcare). The fate of Trumpcare is now in the hands of the US Senate, which could pass the House's bill without changes, modify it, or ignore it. Until it is repealed by the Senate, Obamacare remains the law. 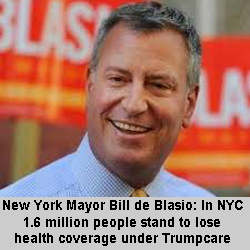 Mayors of US cities have been outspoken in their condemnation of the House's repeated actions to repeal and replace Obamacare with Trumpcare. Strong concerns about the House’s action were also expressed by the health care industry, which represents of the some of the largest and fastest-growing employers in American cities. Almost all of the health care industry's major trade associations registered their dismay over the House's version of Trumpcare, including the American Medical Association, American Nurses Association, American Hospital Association, and the American Health Insurance Plans. • Reimbursements to doctors and other health care providers based on how well a person gets rather than the number of procedures the patient undergoes. Trumpcare overturns much of this. For example, Trumpcare cuts subsidies for persons with pre-existing conditions. Trumpcare would allow commercial insurers to charge more for cancer, chronic obstructive pulmonary disease, Crohn's disease, cystic fibrosis, depression, diabetes, Down syndrome, eating disorders, epilepsy, glaucoma, gout, heart diseases, heartburn, high cholesterol, hypertension, kidney problems, mental health issues, sleep disorders, tuberculosis, tooth disease, and other ailments. According to the World Health Organization’s Global Health Expenditure Database, the United States spends more for health care - per capita and as a percent of GDP - than any other country, but has only the world’s 37th best health care system. By comparison, France is number 1 in the WHO database; Italy, 2; UK, 18; Germany, 25; Canada, 30. In other words, the effectiveness of the United States’ healthcare system is not particularly impressive despite its cost. According to Cornell University economist Robert Frank and journalist Mark Hare, the US health care system has deep historical roots. During World War II, there were labor shortages in the US and caps on wages. Employers found it difficult to recruit workers, so they began offering fringe benefits like health care, which wasn’t taxed. In many cities, large medical facilities were established to deliver health care to workers and their families. Very quickly, about sixty percent of the American population had employer-provided health insurance, a proportion that continues to this day. Many of these patients use their private insurance to receive health care through large regional providers like Kaiser Permanente, Cleveland Clinic, Mayo Clinic, and UR Medicine. Such providers employ their own doctors, nurses, and other professionals who collaborate on patients’ care and don’t get paid if they order more tests or procedures and thus have no incentive to run up patients’ bills. These regional health care systems operate, in effect, like miniature versions of the UK’s National Health Services. Additionally, about a third of Americans are covered by Medicare and Medicaid, single-payer systems of socialized medicine operated by the federal government. Until Obamacare, about ten percent of the US population had no insurance, and about 50 million Americans had health insurance which didn’t cover preexisting conditions. Generally, Americans like and support their complex health care system. The biggest criticism of Obamacare is that private insurers are exiting, leaving only one insurer in some markets. All major programs need periodic adjustments, but Republicans in Congress have steadfastly refused to support Obamacare or mend some of its shortcomings, going so far as to threaten to eliminate reimbursements to insurers for the cost of subsidies for those who cannot afford insurance. There is a sense that Congressional Republicans, by advancing a plan that would cause millions of people to lose their health insurance and drive premiums higher for millions more, are attempting to go back in time when most voters prefer to move on. 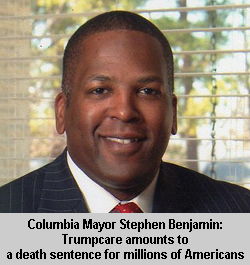 “We can’t go backwards from the Affordable Care Act [Obamacare],” said Mayor Jon Abrams of Edgewood, New Mexico, adding that he would prefer a single-payer health care system, such as Medicare for all Americans. The debate on federally-funded health care for everyone, known as universal or single-payer health care, is spreading in the United States. The political platforms of state Democratic parties in 16 states call for single-payer insurance, including Alaska, California, Hawaii, Maine, New York, North Dakota, Texas, and West Virginia. How might a national single-payer health care system work? According to Frank and Hare, one option is to financially strengthen Obamacare so that more insurers enter the system, and gradually decrease the age at which people can buy into the national Medicare program from the present 65 to 50. Another option is Medicare for all. Medicare for all is likely the most expensive approach, requiring perhaps ten percent of GDP in additional taxes. However, recipients would pay much less in private medical-related payments and would probably receive better care. Evidence from around the world shows that countries with single-payer pay about half what the US pays to provide medical services and get better results. A federally-funded single-payer system would mean less need for private policies, and big insurance companies can be expected to oppose any proposals for such a system. Gradually phasing in a single-payer system by, for example, having the eligibility age for Medicare go down step-by step. Most current Medicare recipients purchase supplemental insurance from private insurers, and this could continue. The federal government could also compensate private insurers for policy changes that drastically reduce their business. Republicans in the United States Senate are working on the House of Representatives’ Trumpcare bill, and reportedly will soon offer a version of their own. The Senate Republicans are working behind closed doors, a curious and risky approach given the importance of health care insurance to the majority of American voters. In 2018, all of the members of the US House of Representatives and half of the US Senators will be up for election. Given the turbulence in Washington, it’s not possible to predict the political climate a year from now, but it’s not inconceivable that some form of federally-funded, universal, single-payer health care system will have the support of both major political partiesif the Republicans and President Trump do not succeed in a meaningful repeal of Obamacare. 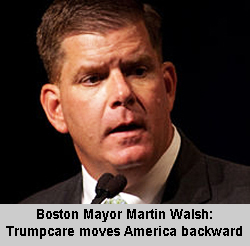 1) United States Conference of Mayors, January 25, 2017, The Nation’s Mayors Stress Impact of Affordable Care Act Repeal. 2) Gallup Poll, April 4, 2017, Affordable Care Act Gains Majority Approval for First Time; Kaiser Health Tracking Poll-Late April 2017: The Future of the ACA and Health Care & the Budget. 3) Centers for Medicare and Medicaid Services, National Health Expenditures Summary, CY 1960-2015. 4) George W. Chapman. GW Chapman Consulting blog posts: May and June 2017. Accessed 14 June 2017 at gwchapman-consulting.com. 5) Mark Hare and Robert Frank, The Real Health Care Fix, City Newspaper, Rochester, New York, 3-9 May 2017. 7) Elizabeth Schulze, Obamacare repeal could undermine a major pillar of President Trump's agenda, CNBC, 23 March 2017. 8) Hare and Frank, op cit.